Winter trucking safety tips for truckers: driving a tractor trailer in serious winter conditions, demands a specific set of skills for all drivers, especially big rig drivers. Too many drivers on the highways do not alter their driving skills, when driving in poor weather conditions, on snow-covered or icy roads. Good maneuvering and skid control skills are essential in poor weather. Knowledge and implementation of proper, preventative safety skills for driving in poor conditions, can truly separate the professional drivers from the rest of the pack. They have the smarts for making good decisions and knowing when conditions are not safe, and it’s time to ‘get off the road’. Driving in bad weather, especially in snow and on ice, is risky due to more ‘ stop time’ required, poor visibility, poor traction and the increased unpredictability of other drivers on the road. The job of a trucker becomes increasingly challenging, when handling a tractor trailer and load in foul winter weather. Slow down – At fault accidents are mostly due to excessive speed. Driving at the speed limit may be legal, but is often too fast for snow covered or icy road conditions.Take as much time as necessary..DO NOT HURRY. Speed kills. 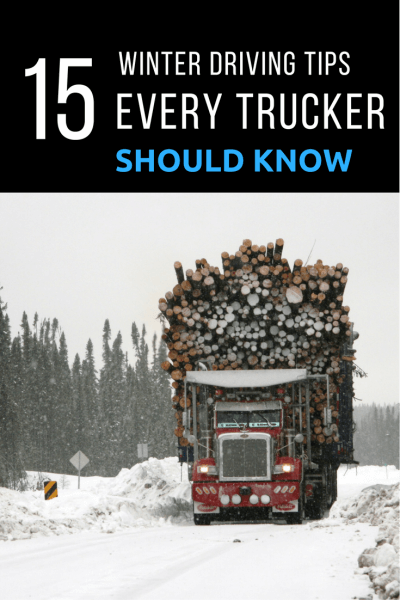 This rule should ALWAYS be at the top of any winter trucking safety tips list. Keep a safe buffer zone around your truck – Leave plenty of room between your vehicle and the vehicle in front of your truck, and beside your truck, when possible . Don’t travel as part of a pack – Traffic seems to move in ‘packs’ on the highway. Find a safe way to get away from the pack and travel alone, with the goal being to maximize the distance around your vehicle. Don’t follow the tail lights of the vehicle ahead – When the snow is so heavy, visibility is low, seeing the tail lights of the vehicle ahead…means following too closely. Keep a safe driving distance back from the vehicle ahead, at all times, especially in bad weather. If the leader makes an error, you will too. Trucks can leave the road, and yours could follow the lead vehicle off the road. Use good, solid judgment — If the weather is so severe that you need to get off the road….. do it. Find a place to get off the road safely and wait until conditions are safe. Don’t stop on the shoulder of the road –– Especially in low visibility situations, when driving in winter, especially ‘blinding snow’, other vehicles can mistake your position for being on the road and as a result, may slam into the back of your rig. Don’t try to be a hero –– When the road conditions are severe, you need to recognize that it’s very dangerous to be out there. Hours of service rules, dispatchers etc., are extra pressures when it a difficult, dangerous position. Don’t feel that you’re letting anyone down by not meeting a scheduled appointment. Braking – Some drivers like to use the jake brake in less than perfect weather conditions. Some don’t. DO NOT ENGAGE THE JAKE BRAKE ON ICY ROADS. Try to avoid overusing your foot brake, unless the entire unit is absolutely ‘straight’ on the road. Don’t over brake when the entire unit isn’t straight… the trailer can slide and spin you out of your position…..the truck slows down, and the trailer does not. This is especially true, when the trailer is empty. Ensure ‘all systems’ are a go — Be absolutely certain during your circle check before you leave, that the defroster and heater are working properly. Wipers, wiper motor, lights, esp. brake and tail lights, washer fluid is topped up, drain moisture from the air tanks, all brakes are set up and windows and mirrors are completely clean before departure. Keep fuel tanks topped up, for extra weight over the drive tires, to aid with traction.Good quality lug tires, with the proper tire pressure, are essential for good traction for the best safe winter driving. Keep tractor and trailer lights clean — When you’re able to stop in a safe place, clear the lights off of snow and ice, which builds up in foul weather….they are vital, more than ever when visibility is poor. LED lights especially accumulate snow and crud. Keep everything clean, so you can BE SEEN. Pack winter driving essentials –– Besides the mandatory roadside emergency kit for trucking safety. A smart trucker is always prepared for bad weather conditions….the truck is equipped with necessary supplies and outfitted for all driving conditions. A smart trucker always uses common sense and their best judgment.….one of the most critical of winter trucking safety tips. I don’t know of any truck driving jobs that are worth giving your life for. If you put your rig, trailer and load in the ditch, chances are, you’ll find yourself standing alone without support from anyone. The finger will be pointed at you. Don’t expect anyone to step forward and say they had insisted on a scheduled delivery appointment. ‘Just on time’ drivers and bad winter weather, just don’t mix. Do what you need to, in order to stay safe.